A technical post on the q2 global reserves and balance of payments data … wonky. Russia, remember, reduced its reported U.S. Treasury holdings by about $80 billion. The (imperfect) transactional data shows over $30 billion in Russian sales too, indicating that Russia did a bit more than just shift its funds to an offshore custodial account. 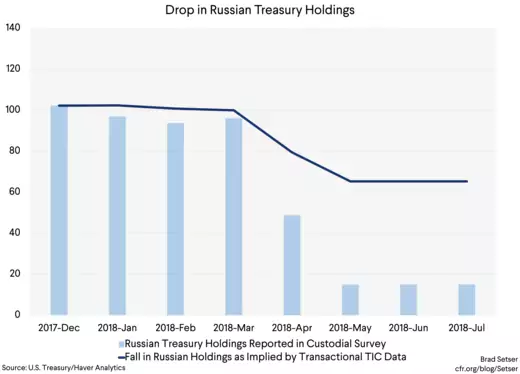 The true fall in Russia's holdings is almost certainly somewhere between the current reported custodial holdings and the stock implied by looking at the TIC transactional data. And the IMF’s just released COFER data on the global composition of reserves—which is finally becoming useful again, as China is now mostly included in the reported numbers—shows an unusually large inflow into Chinese yuan in the second quarter. 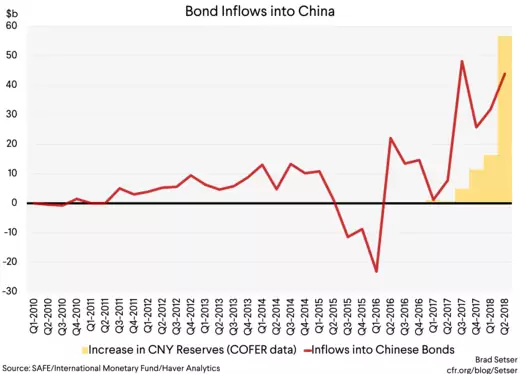 $55 billion in a quarter ($220 billion annualized) in reserve inflows tops anything that China has seen before, in fact, it tops reported (net) foreign purchases of Chinese bonds (private investors were net sellers? Or some of the rise in yuan reserves didn’t go into bonds?). The inflow into yuan reserves in q1 was more like $15 billion. The inflow into yuan also came in a quarter when a simple estimate of dollar reserves (based on the reported dollar share times total reserves) suggests a fall in the world’s dollar holdings. The times are a changing. Just slowly. Reserve growth slowed in q2—for obvious reasons. The dollar started to appreciate. Those emerging markets that had to intervene to keep their currencies from appreciating in early 2018 during the bout of dollar weakness were generally happy to let their currencies float down. And weaker emerging markets had to sell reserves to keep their currencies from depreciating more. And inflows into Treasuries also fell. In a sense the persistence of this correlation though is a bit of a surprise. The bulk of the world’s current account these days is found in the advanced economies—Germany, the Netherlands, Japan, Taiwan, Korea, and the like (the IMF considers Taiwan and Korea advanced economies in their global data). And the financial outflows from the surplus countries these days mostly come from private investors. The days when emerging market reserve growth financed the U.S. current account deficit are long gone. And the U.S. external borrowing need these days corresponds directly to the fiscal deficit. In fact, the U.S. Treasury's fiscal borrowing need significantly exceeds the overall U.S. external financing need. With the yield on U.S. Treasuries substantially above the yield on bonds or JGBs, the most obvious way for the global flow of funds to balance would be for private investors from Europe and East Asia to buy Treasuries. But there just haven’t been big private inflows from abroad into the Treasury market. ** Private investors—big insurers in Asia, pension funds in Europe and the like—have preferred Agencies and corporate debt. Perhaps because they hedge, and the hedged yield on Treasuries isn’t attractive with a flat curve. Or perhaps they just want a yield pickup that central bank reserve managers cannot chase. The net result, though, is that the U.S. fiscal deficit isn’t primarily being financed by foreign inflows. The quarterly data bounces around, of course. 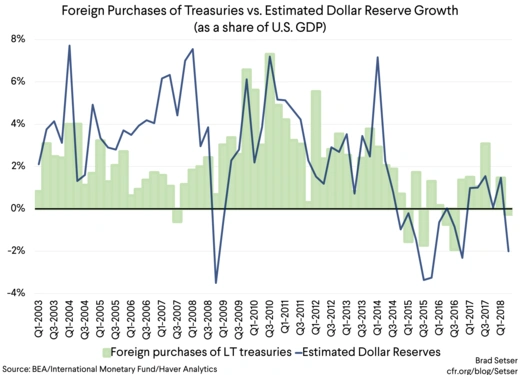 There were relatively strong foreign purchases of Treasuries in q1, back when a number of central banks around the world were intervening to keep their currencies from appreciating against the dollar (time flies). 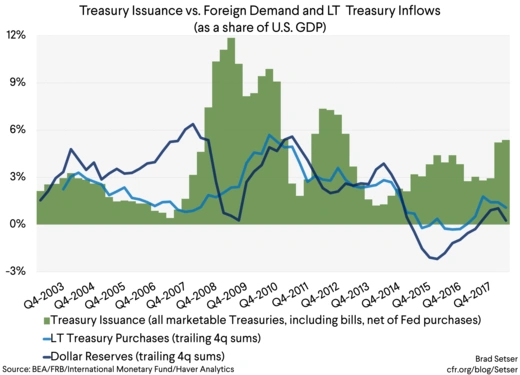 But over the last four quarters of data, the bulk of the increased pace of Treasury issuance needed to finance the Trump deficits is being absorbed by domestic investors. The role foreign demand has played in the U.S. bonds market is more indirect: at times, a strong global bid for U.S. corporate bonds is pulling these bonds off the balance sheet of U.S. institutional investors, and freeing up funds to flow into the Treasury market. That’s broadly the opposite of the pattern before the global financial crisis: then foreigners were buying the safe Treasuries, and American investors were moving into the riskier synthetic triple AAA housing securities that the U.S. financial system was churning out. It also raises something that I have noticed, but cannot yet fully explain. Bond investors aren’t really financing the U.S. external deficit these days. 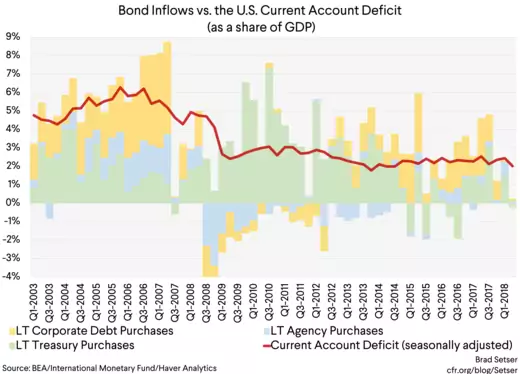 Total foreign inflows into bonds were particularly weak in the second quarter, and have been fairly weak by historical standards in the past four quarters—net inflows in the last four quarters were about 1.5 percent of GDP (vs. a current account in the 2-2.5 percent of GDP range). Foreigners haven’t been big buyers of U.S. equities either. Perhaps the fall off in foreign inflows into U.S. bonds is in some ways an echo of tax reform. Firms are (slowly) drawing down their “offshore” (but not really) portfolios, and so those offshore stashes aren’t a source of demand for onshore corporate bond issuance. And the hedged return on dollar bonds isn’t so great right now. What then is funding the current account and supporting the dollar? Right now, it largely seems, in a formal sense, to be financed through a reverse repatriation flow—e.g. Americans firms bring funds that were nominally held in their offshore subsidiaries abroad back home. 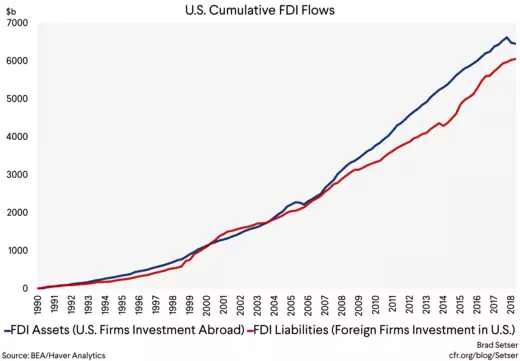 Cumulative FDI outflows have fallen by about $140 billion since the end of 2017. Combine that with modest FDI inflows of around $70 billion, and FDI on net has provided $200 billion of financing for the current account deficit in the first half of the year (an annualized pace of about 2 percent of GDP). But it is a strange source of financing, as it comes not from net inflows, but rather from bringing a portion of the existing stock of offshore investment home. Which implies that the overall weakness in bond inflows is a combination of selling (by the offshore subsidiaries of U.S. firms) and real foreign buying…but sorting out who is who isn’t all that straightforward. I at least haven't quite fully sorted it out. *I assume that the dollar share of countries that do not report detailed data to the IMF matches the dollar share of those that do. The progressive integration of China into the "allocated" data hasn't resulted in any large changes in currency share, so this assumption seems safe: to a significant degree it is an assumption that China and Taiwan have between 60 and 70 percent of their reserves in dollars. **The data on the official/private split is imperfect, and inflows into Treasuries have been stronger than would be implied by global reserve growth, so there are some private purchases—just not huge private purchases.